These really aren't terrible, the return to to official school colors is a positive overall. 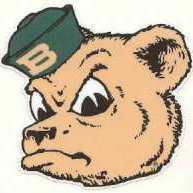 However, the lack of stripes or any other Baylor identifier really hurt. Stripes on the helmet and pants, or even just bear paws on the shoulder pads would have helped Baylor make this look theirs. Baylor, ISU, and WVU now all have essentially the same uniforms only swapping out Green/Red/Navy respectively. It's probably just the lighting of the picture, but the green on the Jets draft caps almost looks like midnight green. Personally, I find it ridiculous they are considering moving away from the gold helmets, as it is iconic to the brand, but I suppose the metallic gold clashes too much with the "Old Gold." The old gold is more consistent with the school's official colors, so from a branding standpoint its probably a good choice. The Baylor Bears have been teasing new uniforms. If the graphics being used are any indication, it seems like the team is switching from Vegas gold back to a more traditional gold. The number font has also received a few tweaks, making the numbers less jagged and more rounded. 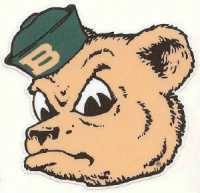 Baylor is wearing Sailor Bear on the helmets for tomorrow's homecoming game. First ever alternate helmet logo for the Bears.